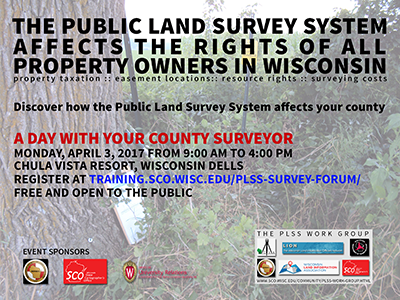 The Public Land Survey System (PLSS) serves as the framework for property ownership in Wiscosnin. Without a properly maintained network of PLSS corner monuments, there is an increased risk of property disputes, inequitable taxation, disagreements about resource rights, confusion over easement locations, and unnecessary expenditures by private citizens and local governments. Join us for a free, day-long forum to discuss the importance of an accurate, up-to-date, maintained network of PLSS corners. This forum will be especially interesting to County Board Members and decision-makers. Replacing PLSS corners requires a surveyor to be an historian, a detective, a forester, an archeologist, a soil scientist and a problem solver. Learn the types of information the professional surveyor researches for locating an original survey corner. Guided by Greg Rhinehart, Adams County Surveyor, attendees will take a scenic half-mile walk into the woods along the Wisconsin River to locate an original PLSS corner that was set over a hundred years ago. Along the way, the group will learn about the types of terrain, methods, and processes used for re-establishing a PLSS corner. Participants will also have an opportunity to use GPS equipment. This field trip will happen rain or shine. Please dress accordingly, bring/wear comfortable clothes and shoes, and be prepared for what the weather holds. Learn how the professional surveyor records and creates tie sheets and what happens after the field collection. This session will exhibit and describe how newly remonumented PLSS corners are brought into the county’s digital parcel fabric, how the PLSS is used to improve parcel map accuracy, and how this effort can save the county money. This event is sponsored by the Wisconsin Society of Land Surveyors (WSLS), the State Cartographer’s Office (SCO), and the UW-Madison Office of University Relations. The event was organized by the PLSS Work Group. This group was formed by individuals and organizations in Wisconsin to advocate and advance the purpose and importance of the Public Land Survey System. Our goal is to educate and encourage State, County and Municipal agencies in improving, advancing and maintaining the Public Land Survey System statewide.